Last weekend, arki_lab initiated community involvement process for Skole+, a collaborative design project which will redevelop the local school environment at Haarby into a space with enhanced capacity for physical activities, benefiting the entire community. We conducted two initial workshops with community members representing different users of the area. The first day involved school’s primary users – such as students and teachers, whist the second day involved users of the nearby sports facilities. 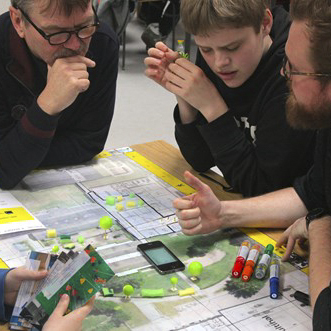 These workshops are structured with our interactive tools – arki_nopoly, prototyping and CoCityApp, which serve as a way of engaging the community with urban design process and simultaneously documenting their ideas. In the first phase of the involement process we applied arki_nopoly – a board game enabling the users to think and act as architects by simulating spatial analysis and design process based on the real site. This method turned out to be a great way of generating conversations about the local urban space, which enabled the local knowledge to come together. The second phase of the workshops consisted of translating the ideas created with arki_nopoly into design prototypes. 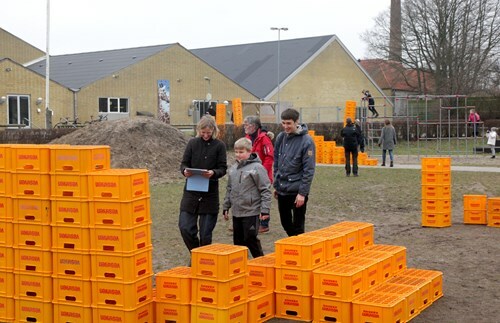 The participants used beer boxes as the building material for ideas on how to improve the school area as a space that fosters movement and physical activity for the entire community. Afterwards, CoCityApp facilitated the further improvement of their proposals by making collages of prototypes. In this way, our methodology enables capturing local knowledge in the form of citizen involvement data that will be incorporated in the further design process. Stay tuned for updates about Skole+ project on our website.